It has been several weeks since the chicken smack down of the century. In some ways we have made enormous and unbelievable gains….and in other ways we are still so far from my ideal resolution. The day after the big fight we let everyone out into the pasture as usual – really just hoping that the extra space would give the boys a chance to cool down and gain some perspective…..Stephen and I being part of the “gaining perspective” crowd ourselves. Things seemed to go ok – Mini kept his distance for the most part, but Andy was still determined to not loose his new found place in the world. And honestly, I couldn’t blame him. As the day wore on and grew darker, we waited for all of the chickens to go up to roost. We grabbed our flashlights, walked through the pasture, and opened the coop door. The site that met our eyes made our hearts sink. There were only six chickens on the roost, Mini was no where to be found. Exile is hard on anyone, but especially hard on a former leader. As we combed the barn and pasture with no success, I eventually saw a little bit of white on the ground next to the fence in a pile of leaves. It was Mini – just laying there. He hadn’t even bothered to go back to the coop for the night, he had simply given up. We took Mini back to the house, gave him some food, and set him up in the dog crate for the night, hoping he’d have a little more spark by morning. Spark….looking back these days I rather think I had wished for gracious humility instead of spark. As the weeks progressed, Mini returned back to the coop, and Stephen and I found ourselves spending more and more of our free time doing what we called “chicken therapy.” Andy eventually allowed Mini back into the flock, but he still threw his weight around, literally all 11 pounds of it. Despite the occasional knockabout, things had become more peaceful than even our hopes anticipated. But, that brings us back to gracious humility…and the wrong rooster’s lack of it. Andy has really been quite a surprise to us, and in some ways he always has been. 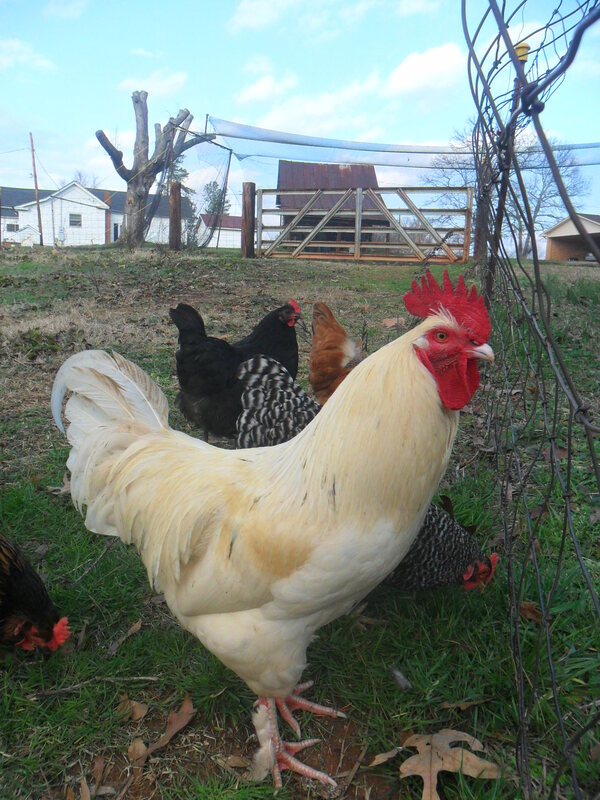 He’s done a remarkable job at taking care of the hens and he’s never shown the least amount of aggression towards us – even when we pick him up, which he doesn’t like very much. He’s proved to be both calm and fair minded, sometimes a rare trait in a head rooster. Mini, on the other hand, is back to his old self….which means he’s back to biting and flogging, and we are the lucky recipients. It hurts and I don’t like it. I had hoped, perhaps dumbly, that this particular aspect of his personality had changed, but I’m not sure you can break what is inherently part of his genetic makeup. So, here we are. 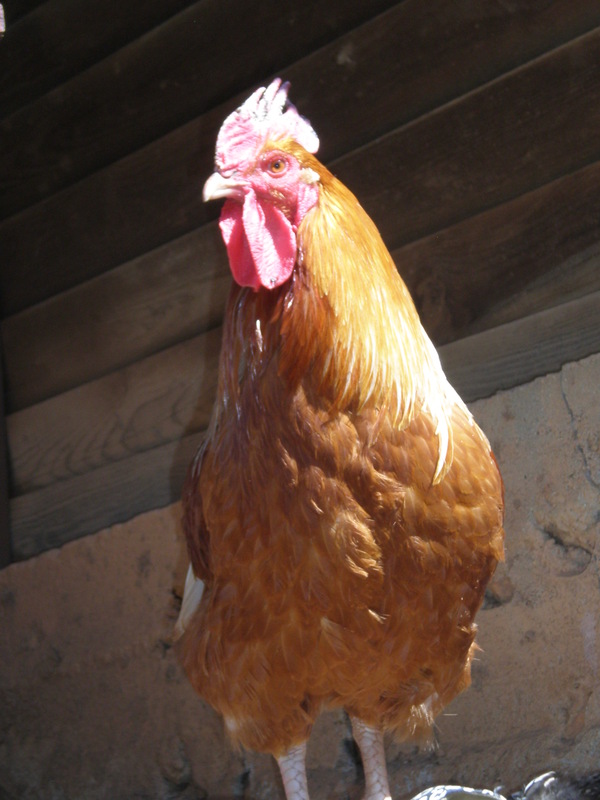 We have two roosters….and where do we go from here? I’d like to think that I don’t have an answer to this question, but if I’m being honest I probably do. I’m hurt and disappointed, I want things to be different. I want Mini to feel the same about me as I do about him; but he’s a chicken and he’s not supposed to, and he feels about me exactly the way he should. And that doesn’t make either of us right or wrong….and that is what makes the situation so hard. So, here we are. 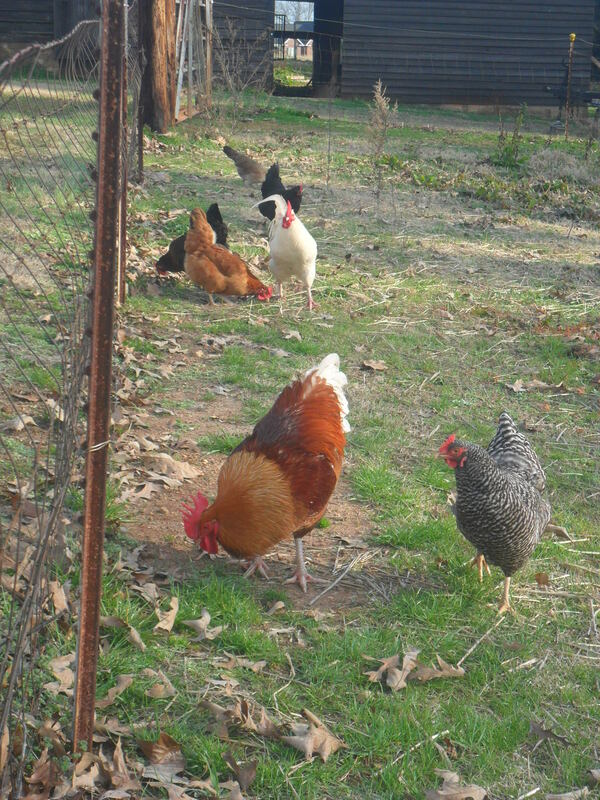 We have two roosters….and that’s how it’s going to be for awhile, but probably not how it’s going to be forever. And, just like it took Mini awhile to get his confidence back, it’s going to take me awhile to get used to the fact that it’s not going to be both Mini and Andy forever.